YouTube launched a multi-video uploader that lets you upload videos that are up to 10 minutes in length and up to 1GB in size. You need to install a software (Windows-only, for now), but you'll upload videos from your browser. The advantages are that you can upload bigger files, you can select more than one video (even all the videos from a folder) and it's allowed to leave the page while the videos are uploaded. The disadvantages: YouTube installs an application that runs in the background and automatically launches at startup. Youtubeuploader.exe uses a lot of memory even when you're not uploading videos to YouTube and also launches Google Updater. Google Video has a similar tool, but it doesn't work from a browser and you can't enter the metadata before uploading your videos. On the other hand, Google Video doesn't mention any limits for your videos. A blog post from March 2006 explains why YouTube decided to limit uploads to short videos. "We've gotten a fair amount of emails lately about the new 10 minute limit we've implemented for video uploads. For those of you not familiar with this change, we've always had a 100MB file limit for uploads. We also recently implemented a 10 minute length limit. This change won't impact the vast majority of our users. We know that over 99% of videos uploaded are already under 10 mins, and we also know that most of our users only watch videos that are under about 3 minutes in length. (...) We poked around the system a bit and found that these longer videos were more likely to be copyrighted videos from tv shows and movies than the shorter videos posted." 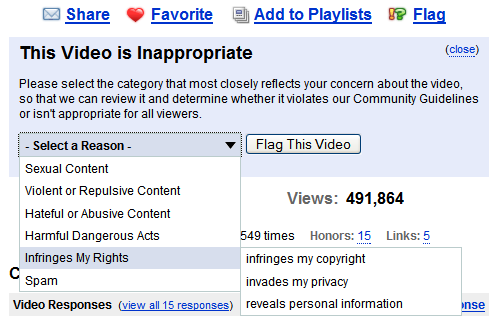 On a related note, YouTube introduced more categories from which you can select when flagging videos. "When users flag a video, it is reviewed by real-life humans at YouTube who check to see if the video should be removed, age-restricted or left alone," explains YouTube. I think it's hard to decide when a video infringes copyright or YouTube's policies, but it could be an interesting exercise to launch a new YouTube section that contains flagged videos, where "trusted" users could vote if the videos deserve to be removed. Similar to Picasa Web Albums, isnt it? You mean the integration between Picasa and Picasa Web Albums? Not quite, because you'll still upload videos from your browser. I had to put a lot of videos on YouTube one day and I created a program to upload videos to youtube for me. The fact that it launches a Google updater without asking that puts itself automatically into the startup is very annoying. Bad program! I tried the video uploader link but I keep getting a different page. I can only upload 1 video at a time. Has that page changed? YouTube's uploading feature has improved a lot since 2007 and you no longer need to install plugins if you use the latest versions of Chrome, Firefox and other modern browsers. Just use the standard upload page.